Everyone’s busy these days; with so many things on the mind of the average person, it’s no wonder that people frequently miss healthcare appointments. This is no doubt a barrier for the healthcare professionals, who find themselves having to reschedule their already busy days on the fly, but also exceptionally irritating for other patients that could have benefited from the earlier time slot. Clearly a direct, difficult to miss method of delivery is required for appointment reminders sent from healthcare practices. At the same time, a direct, easy to digest communication system would make reminders related to the timely renewal of prescriptions, and the regular taking of medication, that much more effective. This is where UK healthcare SMS messaging service that we offer at TectLocal comes into play: text messaging allows you to communicate with your patients and clients quickly and directly. Sending a reminder text before an appointment can help to dramatically reduce the number of missed or late appointments at hospitals, GP surgeries, dentists and veterinary practices. Having your patients turn up on time for their appointments is one of the most important factors in the smooth running of a practice. Reduce no-shows with cost-effective SMS reminders the day before an appointment. Send aftercare information or healthcare leaflets as attachments in an SMS to reduce printing costs and ensure that your patients don’t forget. Your patients can store the information on their phones so it doesn’t get lost in their bags. Send a text message to your patients to let them know when their results have come in. SMS is quicker, cheaper and more effective than sending a letter or making individual calls to people who may not answer their phones. Messenger is compatible with a huge range of practice management software, and with the help of our tech team you can have your SMS service integrated in no time. Automate your messages to save your team even more time. Running a new stop smoking initiative or illness support group? Make it easy for patients to register their interest by providing a short code and keyword for them to text in to. Facilitate communication between members of a practice-run support group or other initiative by creating an SMS contact group. Make your support services more personal with a range of customisation options. 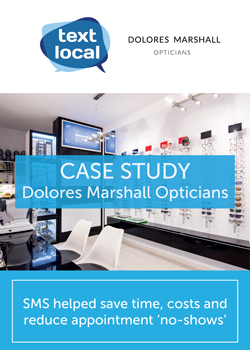 Download latest healthcare case study from Dolores Marshall Opticians.